"Abandoning fishing the deep, you took up the rod of the Cross..."
Abandoning fishing the deep, you took up the [fishing] rod of the Cross wisely in all things, and caught up the nations like fish, O all-praised one, and as the Lord spoke of you, He made you to be a fisher of men, drawing up towards piety. 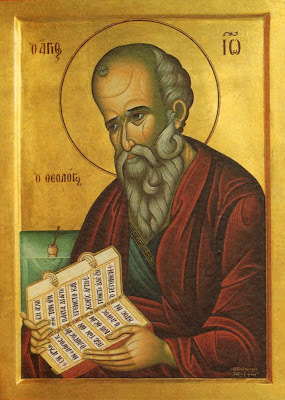 Therefore, you sowed the knowledge of the Word of God in Patmos and Ephesus, who bore fruit through your words, O Theologian Apostle. Intercede with Christ God that remission of offenses be granted for those who celebrate your holy memory with fervor. "In Paradise formerly, we were stripped naked..."
In Paradise formerly, we were stripped naked through tasting of a tree, and death was brought about by the enemy. And now, by the tree of the Cross, the garment of life is brought to men upon the earth, and the whole world is filled with joy seeing it exalted, as the people all together cry out in faith to God: Your house is filled with glory. Note: In honor of the upcoming feast of the Translation of the Holy Relics of St. Amphilochios of Patmos on September 19th (notably his primary feast is April 16th which often falls in Great Lent), and in honor of this great and newly-canonized Saint of the Orthodox Church, the following is my translation of the Akathist to the Saint from the Greek text here, offered for the many who love the Saint and who benefit from his speedy help. Also note that the meter of this translation is not set to match the original music. 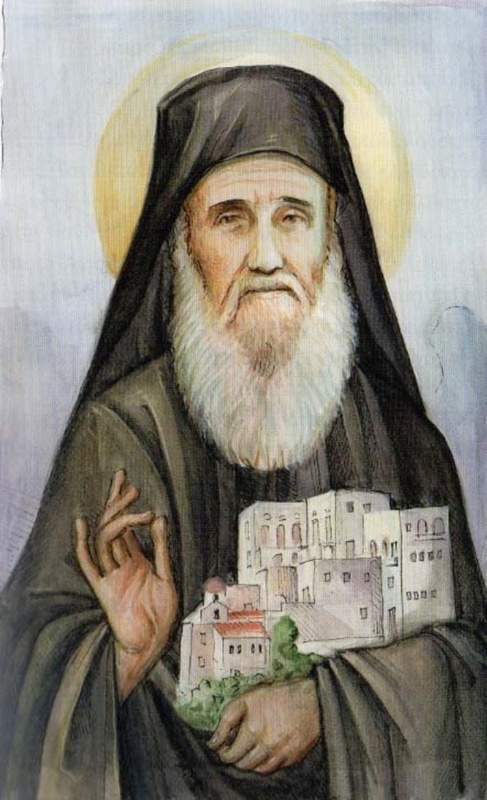 May St. Amphilochios intercede for us before the Throne of our Lord, to help all who suffer throughout the world, to help heal the wounds of Orthodox Christians, to guide our leaders towards peace, reconciliation, love and truth in these difficult times, and to especially protect his Monasteries and spiritual children! 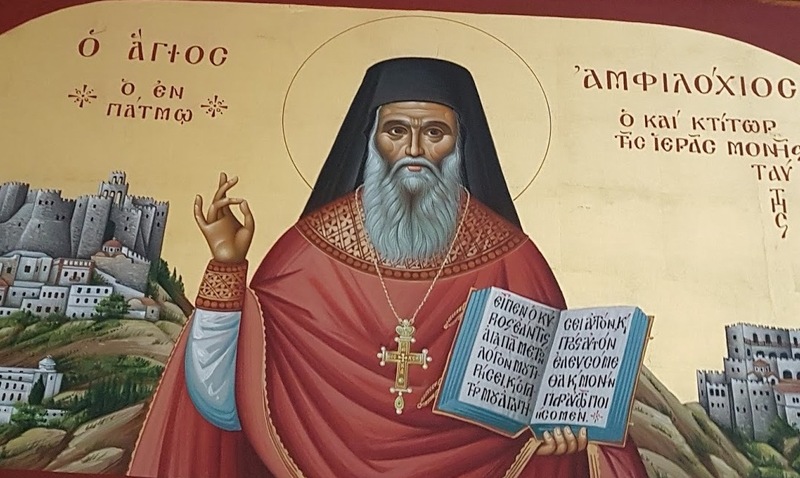 To praise you as is right, O Amphilochios, we would need heavenly mouths and tongues, for similarly you appeared to the Bodiless Ones, but desiring to hymn your victorious struggles from defiled lips, therefore I cry out to you: Rejoice, O blessed Amphilochios. Rejoice, you through whom the enemy is defeated. Rejoice, the folly of heterodox rulers. Rejoice, man translated to and ever dwelling in Eden. Rejoice, for you dissipate earthly pains. Rejoice, spring watering forth wonders. Rejoice, you through whom the island of Patmos rejoices together. Beholding you greatly shining like a radiant star with the glory of the Lord, we who have been darkened in mind have received the gifts of your wonders, O all-radiant one, and we therefore in gratitude cry out to God Who enlightened you: Alleluia. Rejoice, protection for those who call upon you. rejoice, fellow namesake of the mystic of Iconium. Rejoice, God-planted child of the chaste Irene. Rejoice, for you encircle the faithful like a tower. Rejoice, new song of praise of Greece. Rejoice, the most-radiant brightness of your homeland. Receiving the teachings, O Father, and written words, you learned knowledge and desired things divine, therefore your spiritual father and fellow namesake offered you guidance which you heard as a novice, becoming a descendent of the Fathers, who cry out: Alleluia. Rejoice, justification of Orthodox dogmas. Rejoice, tree adorned with the fruits of virtues. Rejoice, for through ascesis you became like the venerable Saints. Rejoice, fellow-dweller with the Bodiless ones. Rejoice for you were filled with many wonders. Having godly zeal, you venerated the Holy Lands, where the feet of the Lord walked, and went to the holy city of Sion, as a deer thirsting for the spring of water, and as a bee gathering pollen, crying out to God: Alleluia. Rejoice, praise of chaste monastics. Rejoice, imprint of the Fathers of old. Rejoice, for you join rank with the liturgists on high. Rejoice, for you partook of astonishing gifts. Rejoice, for you lifted up the ethos of the world. Rejoice, you who dissolve the dread of the passions. 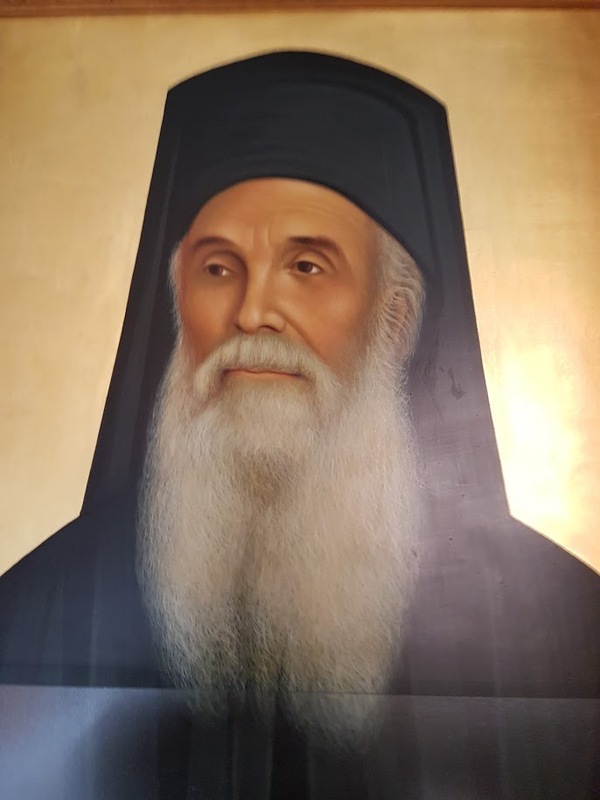 The Monastery of the Son of Thunder [St. John the Evangelist], which was founded by St. Christodoulos, became the theater of your struggles and the stadium of your feats, for you did not shy away from struggles, and now together you cry out in Eden: Alleluia. Rejoice, light of the choir of monastics. Rejoice, ready helper of the faithful who call upon you. Rejoice, boast and adornment of your fellow venerable Saints. Rejoice, for you dissipate the cloud of ignorance. Rejoice, for you ever partake in theosis. Rejoice, dwelling-place of the Holy Trinity. Not knowing your labors, all the faithful people of the Dodecanese out of love came and were granted rest from their labors, for you liturgized in the Cave [of the Apocalypse], and you received them as your children, teaching them to cry out with you: Alleluia. Rejoice, benefactor of the faithful who entreat you. Rejoice, pride of the Kathisma of Kouvariou. Rejoice, foundation of the faith against dangerous heresies. Rejoice, for you grant healing to those ailing. Rejoice, protector of your monastery. Rejoice, the song of the Bodiless Angels. You protected your homeland like a great cloud during a time of slavery, which darkened the souls of the Orthodox, and you did not at all bend to the wiles of the tyrant, and in your soul you bore the marks of exile, crying out to Christ: Alleluia. Rejoice, container of every virtue. Rejoice, winged eagle of virtue. Rejoice, calm harbor for those troubled by the passions. Rejoice for you protect the city of Chania through your intercessions. Rejoice, for you had nothing of your own, O estranged one. Rejoice, treasury of many wonders. 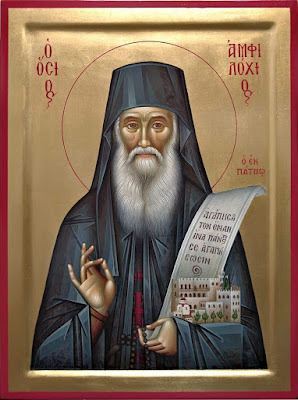 Your philosophical life was strange to the world, as you founded many schools [of virtue] on Patmos, Rhodes, Ikaria and Aegina along with Kalymnos, and practically served as a most-tender Father, while the choirs of monastics cry out: Alleluia. Rejoice, river of living waters. Rejoice the granter of various wonders. Rejoice, root full of fruit which nourishes the faithful. Rejoice for you taught to protect creation. Rejoice, deliverance from bitter circumstances. Rejoice, you who worshipped with the Prayer of Jesus. Through your labor pains, you founded the virginal choir of nuns on Patmos named "The Mother of the Beloved", and you led them towards Paradise that is desired, where you join ranks together with the Angelic Armies, crying out to the Lord: Alleluia. Rejoice, rhetor of the heavenly life. Rejoice, strong-voiced nightingale of gifts. Rejoice, you who healed incurable pains with your prayer. Rejoice, for the nations have come to see your light. Rejoice, songful ode of the venerable Saints. Rejoice, eternal intercession for your monastery. 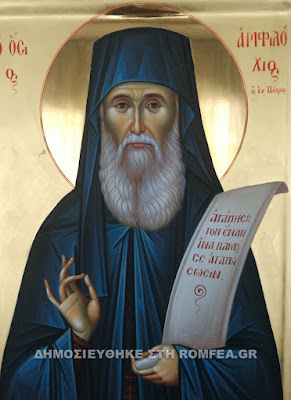 All of the world has been enlightened by the rays of light of your godly knowledge, therefore, God-loving souls dwelling in shadow you enlightened, guiding them to walk with the teachings of Orthodoxy, crying out: Alleluia. Rejoice, awesome thunder of theosis. Rejoice, wine offered up to gladden the people. Rejoice, fragrant lily bearing the fragrance of graces. Rejoice, voice of bold sounds. Rejoice, for you grant gladness to the faithful. While awake, Mary, the Theotokos appeared to you, together with the Beloved Disciple John, informing you before your last Pascha of your coming repose, not fulfilling your fervent request [of delaying your repose]. This showed the love of your soul for your children even in death, crying out: Alleluia. Rejoice, founder of your famed monastery. Rejoice, deposer of the boldness of the ancient enemy. Rejoice, most-true friend of the wondrous Nektarios. Rejoice, for your prayers sprinkle dew on those below. Rejoice, quencher of the flames of passions. Rejoice, ever-flowing spring of wonders. As the Psalm says, grace pours forth from your relics, curing the weakening by illnesses and filling our senses with the fragrance of the Holy Spirit, O all--joyous one, inciting us to cry out to God: Alleluia. Rejoice, fearsome fighter of the enemy. Rejoice, depiction beforehand of the life to come. Rejoice, protection of your monastery and of the choir of nuns. Rejoice, for you gladden the Church with your light. Rejoice the divine adornment of Patmos. Rejoice, you who lead souls towards heaven. O boast and pride of Patmos, Amphilochios, faithful healer of the Church (3), do not cease to entreat Christ that we might be granted to dwell together with Him in Eden, and that we might together join chorus to ceaselessly cry to God: Alleluia. Then the Kontakion again straightaway.